I brought this lace dress back in the winter and I spent most of spring in it. I love the high low cut and I love pairing it with a dress shirt. I also just recently got this bag from Brandy Melville (I've been quite obsessed with them lately). Do you guys have that go to store? esp for summer? Hi, doll! Thanks for swinging by the blog and leaving a comment- I love meeting fellow bloggers! That dress is stunning! I love the way you styled it! This is such a great outfit! Love the color of the bag and that necklace! I am in love with that bag!! Will definitely have to check out Brandy Melville. I just came across your blog and wanted to tell you that it is so well designed! I love all the graphics and layout, even your disclaimer looks nice. I'm your newest follower, can't wait to see more. Oh wow, I seriously am crushing on this look! I love how you reinvented the lace dress into a skirt. Its makes for a stunning one! And the mint bag is such a perfect touch. I love that color! great great post, i really love itttttttt! nice to meet your blog!! Such a pretty dress! And that mint backpack is so pretty! The combination of white & mint is so pretty! I love your hat & necklace too. I really love that bag. Looks like good quality and the color is everything!!! Love the lace dress with the robin's egg blue satchel! Absolutely gorgeous photos :) sighhh ive missed your blog! oh my gosh this is so lovely! 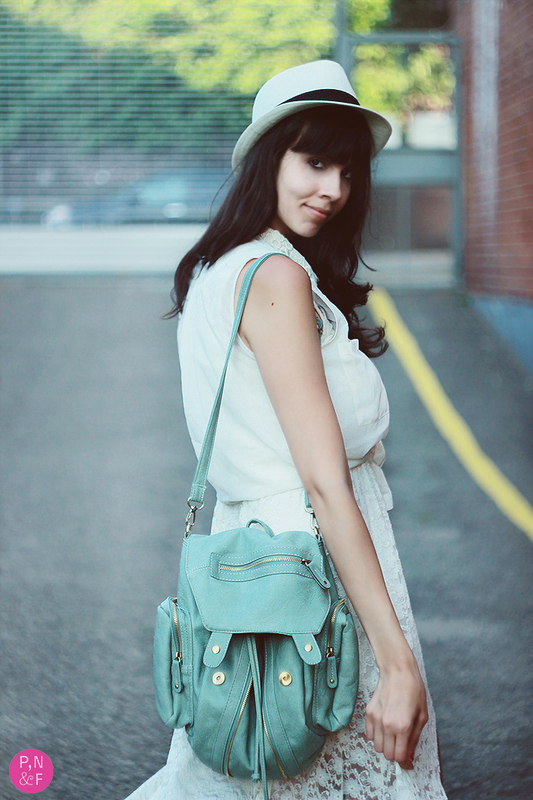 love how you styled it up --- the bag is great with it too! perfect look dear!love your mint bag!! please honey, can you vote on my photo?? B.M. is fast becoming my favorite new haunt. I want that pretty bag so badly! Love the shape and the color! Might have to stalk the website to find it today! The instant I saw that bag, I began to covet it. Ah, love the all white with a touch of mint, perfect! You're style is so amazing! You've got everything down to a tee here, the lace, pastel and summer trends! 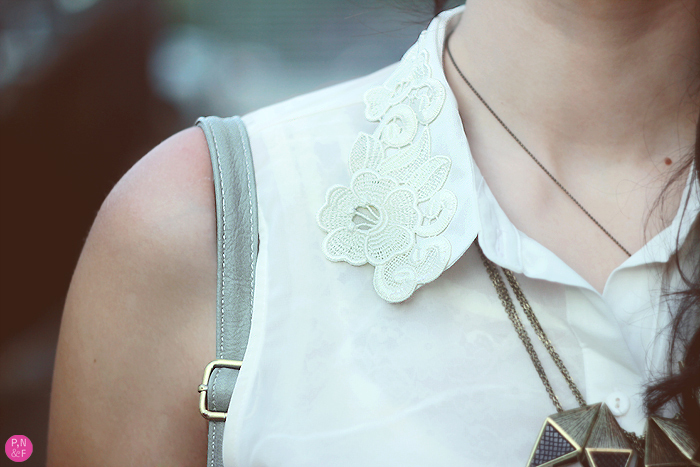 The necklace adds an edgy touch to the sweetness! And I want your hair! oh man I love all of this! Oh that dress. Wow. That's all I can say. Perfection. Reallu pretty outfit...love the color of your bag! so nice! Great purchase! Good thinking of saving it for spring :) Love the bag and the whole ensemble. The lace details is beautiful. the bag is so cute. i love the color. such nice touch of lace! I love everything about your outfit! Ahhh I just want to copy it :P Your dress is so pretty with the lace and I really like the mint color bag! Nice pictures! Thank you for commenting and visiting my blog! Like yours too! How about following each other on bloglovin and gfc? Let me know once you do, that way I’ll follow you back! Waiting for you! amazinngggg dress! Love its flowy 70s vibe! LOVE this outfit!! True fan! Am following you to;) Great blog, keep up the good work!